Explosions occurred at 5-10 minutes intervals and produced spatter-rich jets to heights to 200-300 m. Glow from the vent and weak spattering indicates that the magma column inside the western vent has risen high. According to the local mountain guides from Magmatrek, activity has increased significantly during the past 3 days, especially at the NW vent. A group of VolcanoDiscovery has arrived on the island and will report in more detail in the following days. Our friend Petra who climbed the volcano last night reports that activity is rather low at the moment. There were no explosions observed during the time spent at the summit (about one hour). Activity has been at relatively low to moderate levels recently. Explosions of small to medium size occur regularly from the "usual" (mainly the eastern and western) vents. Activity continues at moderately elevated levels. Spectacular explosions especially from the NE crater can often be seen on the webcam as well. In the NW crater area, two adjacient vents often erupted simultaneously. One was ejecting dense jets of incandescent gas, almost no ash and only few incandescent tephra that formed candle-like fountains reaching 100-200 m height, and accompanied by loud jet-engine like noises. The other one erupted silent, dense low ash plumes and glowing material to 50-100 m. Eruptions occurred every 20-30 minutes on average. Two vents in the central crater area were constantly glowing and ejecting pulsating steam puffs, but did not erupt. 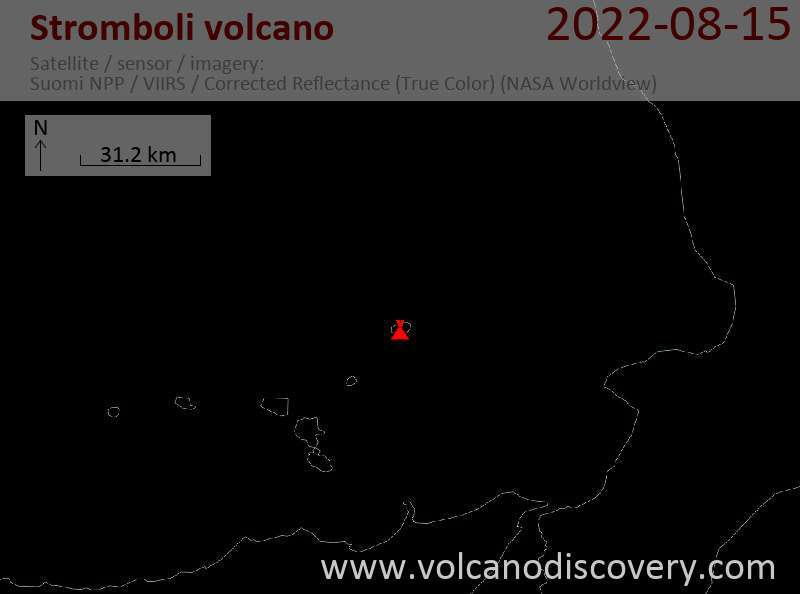 Over the past days, Stromboli has returned to normal levels of activity with frequent, mostly small to medium-sized explosions and low to medium tremor. Small lava overflows and frequent rockfalls still occur. Activity has remained generally elevated and seems to have increased yesterday. Current seismic recordings show strong explosion signals and an increase in tremor. A small lava overflow is currently visible from the NE crater. Today, tremor has decreased again a bit, but overflows remain active at least in the upper parts of the slope. Relatively large explosions and near-constant rockfalls on the Sciara continue during the whole time. After decreasing a bit yesterday, the overflow of lava from the NE vents has gained in strength this morning again, accompanied by constant rockfalls, relatively strong explosions and higher tremor. Spattering and lava effusion have increased from the NE hornito, feeding a new relatively large sustained lava flow on the Sciara del Fuoco. Activity has decreased a bit yesterday, but strong explosions and small lava overflows from the NE crater rim and a vent at the outer flank continued, accompanied by frequent rockfalls on the Sciara. At the moment, activity seems to be increasing again. The seismic signal shows increased tremor and continuous rockfalls on the Sciara, as well as large explosion signals at intervals of approx 15-30 minutes. Activity remains elevated, with magma filling the NE crater to the rim and sometimes relatively strong explosions. No significant new overflows have occurred since the last update. The small lava flow issuing from the breached NE crater continues, but has not progressed much. Frequent glowing rockfalls descend the Sciara del Fuoco. Magma stands high inside the conduits. A small overflow is occurring from the NE crater. The lava flow reaches about 100 meters length at the moment. Tremor and explosion signals are moderate to elevated. The lava flow continues to be alimented, but effusion rate has apparently dropped and only the upper portion of the flow seems currently active. The seismic signal shows strong eruption tremor and continuous rockfall signals. The activity continued throughout the night and the lava flow has reached the sea at the base of the Sciara del Fuoco. At the moment, the new flow has decreased but remains weakly active and tremor elevated. The new lava flow is well alimented and has reached several hundred meters down on the Sciara del Fuoco. Explosive activity continues as well. A new larger lava flow from the NE vent has started this afternoon to descend the Sciara del Fuoco, accompanied by glowing rockfalls and strong tremor. The eruption was preceded by very large strombolian explosions during the morning. A late addition - photos of the lava overspills and lava flows on Sciara del Fuoco during the first half of January. Activity has remained more or less unchanged. Explosions, sometimes strong continue from several vents,and small amounts of viscous lava overspills the rims of the NE crater. Activity remains elevated. Lava continues to overspill from the lips of the NE crater, showing that the magma column stands high inside the conduit. Frequent strombolian explosions are reaching heights of 2-300 m and the tremor signal is strong again today. Yesterday evening's lava flow has once again beeen very short-lived. Activity (effusion rate) sharply dropped late in the evening and today, only very small amounts of lava are still overspilling from the NE crater rim. Tremor and rockfall signals are much weaker as well. 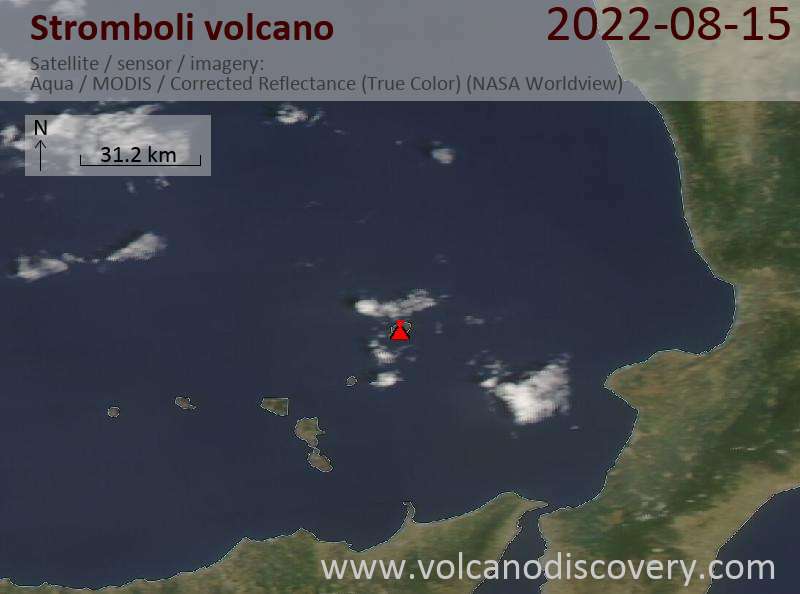 You can follow this live at webcams.volcanodiscovery.com/Stromboli. No significant changes have occurred recently. The seismic signal shows medium tremor levels with phases of medium to high values, and there are frequent (about 10 per hour), sometimes quite powerful strombolian explosions from the various active vents. Small amounts of lava sometimes overspill from the NE vent. Seismic activity remains elevated and accompanies strong explosions, mainly from the NE vent. No recent lava overflows occurred. Tremor and explosion signals have further increased today, but no significant new lava overflows have occurred. The NE crater continues to produce spectacular and relatively large explosions of bursting lava bubbles. Tremor as well is elevated.